August De Boeck studied at the Brussels Royal Conservatory of Music with Alphonse Mailly, and graduated in 1891 with the Diplôme de capacité for organ. In 1899, in Brussels, he became acquainted with Paul Gilson, with whom he studied orchestration and who encouraged him to compose. August De Boeck was mainly interested in vocal music, and it is no wonder that his fame rests mostly on his five operas, three of which are masterpieces: the fairytale opera Winternachtsdroom ‘Winternightsdream’ (1902), Reinaert de Vos ‘Reynard the Fox’ (1907-1909) and La Route d’Eméraude ‘The Emerald Road’ (1913-1920), also known as Francesca. He also composed a number of brilliant symphonic works, such as the Symphony in g minor (1896), a Violin Concerto (±1912-1934), the Concerto for Hans piano (1926-1929), and a number of shorter pieces, like the Dahomey Rhapsody (1893), the Nocturne (1931) and the Fantasia on two Flemish Folk Songs (1923). De Boeck’s Concerto for Hans piano (1926-1929) was commissioned by Pierre Hans (1886-1960), an amateur pianist with abnormally thick fingers, who was looking for a way to keep playing the piano. Being an engineer, he contacted the French firm of Pleyel, and together they designed and built a concert grand with two keyboards, with the upper keyboard tuned half a tone higher than the lower one. This created a range of possibilities, like making it easier to play chromatic passages. But it offered other, perhaps more important, advantages as well. For example, it allowed the pianist to repeat complete chords at a very high speed. This way the Hans piano made it possible to use special effects; and it had a highly distinctive sound. It is therefore no wonder that a number of concertos for this new instrument soon saw the light of day, including those by Pierre Hans himself, by Carl Smulders, René Barbier, Ernest d’Agrèves, and also by August De Boeck. The astronomical cost of the instrument strongly hampered the breakthrough of the Hans piano and the outbreak of World War II killed it off. It therefore made complete sense that a virtuoso organist like De Boeck was fascinated by the Hans piano and that he took on the challenge of composing a concerto for it. All these concertos for Hans piano were premiered by the Antwerp pianist Mit Scapus, alias Maria Van Dommelen (1892-1989). She had been among De Boeck’s harmony students at the Antwerp Royal Flemish Conservatoire of Music before World War I, she arranged quite a few pieces from the standard piano repertoire for Hans piano, and she taught special Hans piano courses at the conservatoires of Antwerp and Paris, in Aachen, in Luxemburg and in The Netherlands. In fact, the solo part of De Boeck’s Concerto for Hans piano was created by Mit Scapus. Her sloppy and incomplete manuscript, which can be found at the Letterenhuis in Antwerp, is the only source that has any specific indications meant for playing the concerto on a Hans piano. This in and of itself would make a reconstruction of the original part for the Hans piano very problematic. However, a modern performance of this concerto in this form would face other insurmountable problems as well, which is why the Belgian (Flemish) composer and conductor Frits Celis asked me in 1981 to arrange De Boeck’s concerto for a standard instrument. My arrangement required rewriting numerous passages in which both keyboards were used simultaneously in the same range; the quick repetition of complete chords, which occurred mostly in the Scherzo, had to be given up; and the short cadenza of the finale, which De Boeck had merely sketched, had to be rewritten thoroughly. 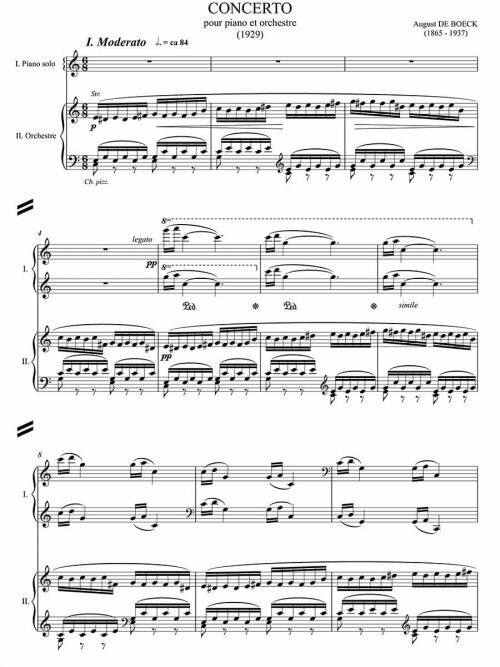 The piano concerto has three movements, a lyrical Moderato, which evolves without a pause into the sparkling Scherzo (Presto), and a final dance-like Allegro. The work is about twenty minutes long. The composition is solidly constructed, consisting of a kind of cyclic procedure. Not only are the themes of the first part ingeniously woven into the fabric of the conclusion of the finale, but the second movement, Scherzo (Presto), grows organically out of the opening theme of the concerto, and it regularly echoes the whole-tone scale of the Moderato. This Scherzo (Presto) was written first, in 1926, about three years before the other two movements. 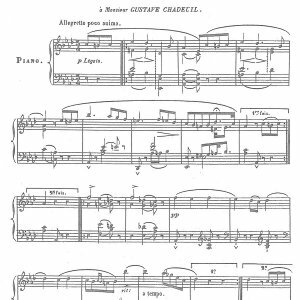 The premiere of the original version, for Hans piano, took place in Antwerp on November 30, 1932. Mit Scapus was accompanied by the Symphony Orchestra of the Royal Society of Zoology [sic] in Antwerp, conducted by Flor Alpaerts. The version for modern grand piano premiered in March 1983 in a Brussels television studio of the BRT [the Belgian (Flemish) Radio and Television], by its Philharmonic Orchestra conducted by Fernand Terby, with me as the soloist. The first public performance took place on September 6, 1985, in deSingel in Antwerp, with Frits Celis conducting the Orchestra of the Royal Flemish Opera. This score was published in collaboration with the Centre for the Study of Flemish Music, where the parts can be ordered (www.svm.be). Jozef De Beenhouwer and Johan Favoreel edited the score based on the available sources. 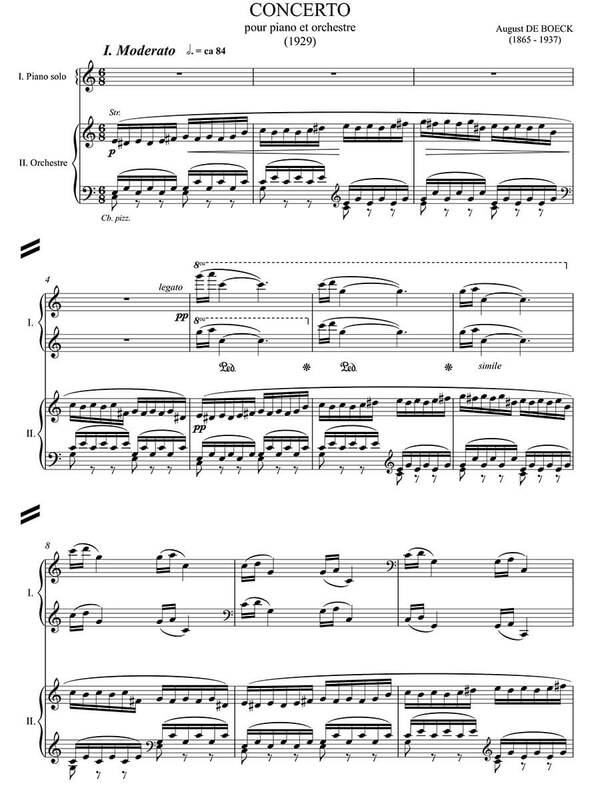 The version with orchestra was published in this series in 2018, with the number 2565. The concerto was recorded by Jozef De Beenhouwer and the Janácek Philharmonic Orchestra, Ostrava conducted by Ivo Venkov (Phaedra – In Flanders’ Fields no. 71 – 92071).